I recently got the most surprising and perhaps best question I have ever heard during a presentation! It came from one of about 25 4th and 5th graders at Tarrytown United Methodist Church. But here is the one question that really game me pause: “What’s in your pocket?” I was wearing sort-of-baggy jeans and had a lot in my pockets, so it wasn’t such a weird question. I thought about dismissing the question, but then I decided to go for it! So this is what’s in my pocket. It says a lot about SYM. It was missing one thing that day. I wasn’t carry the Word of God. However, I put that on in my heart and mind every day. So, what’s in YOUR pocket? 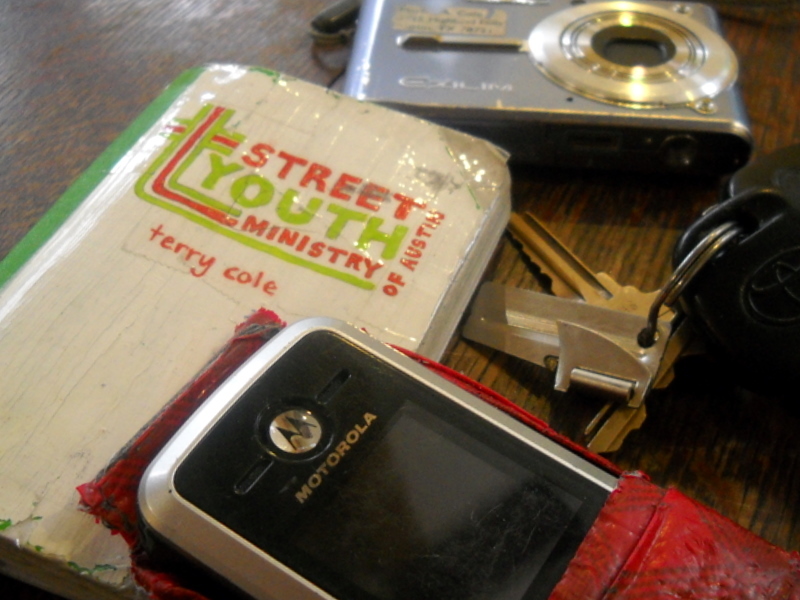 I was unsure how to help a group of street-dependent youth relate Matthew 3. I take the Bible stories in order to teach chapter by chapter, but I don’t ever want it to be dry or seem irrelevant to the mostly homeless youth that I work with. Some weeks are more challenging than others. This week, I felt challenged with the material. I finally decided on my approach and prayed it would work. We watched Matthew 3 on video. It’s a nice video, with word for word NIV narration. Nothing skipped and nothing added. I watched the kids as John the Baptist preached to the Jews in the wilderness, sitting around peacefully seeking after God as a community. I watched the street-youth squirm and express disgust with their mouths and body language as John preached fire and brimstone to the Pharisees. I watched them take in the scene of John begging Jesus to baptize him, only to have Jesus say, “No… It’s right for you to baptize me.” And I think I saw looks of pain as the words from God, “This is my son. In Him I am well pleased,” words I think they may never have heard from their own father. Now it was my turn. Time to make this relevant and attractive. We reread the first section that describes John the Baptist. I asked the kids, “Who is this guy? What did he behave like?” They correctly saw him as an outcast… some kids even called him homeless. I asked, “Where is he? Why do people go where he is?” They answered, “In the wilderness… in the desert. You go there to get away from people and everything else.” “Right! The Bible doesn’t say, but I’m sure that John the Baptist is escaping from some troubles. He doesn’t fit in. He’s got problems with how things work in his day. He stays out in the wilderness for a reason. Sound familiar?” They nodded. Then one kid said, “This is the only church I’ll go to. We’re here with you learning about the Bible.” “Yes, it’s a lot like John the Baptist in the wilderness, isn’t it?” I said this with deep satisfaction and joy welling up inside me. Matthew 3 was relevant and attractive to them! They had gotten the message and here we were, out in the wilderness, about to discuss the baptism of Jesus and those wonderful words: “In you I am well pleased!” It was a good day! Is faith a resource for you? "Chuck, can I ask you a question?" I was facing a 20 year old male whom I see about once a week. He has a place to stay and goes to school to become an artist. But he comes to see me once a week or so. "Sure he said." I explained, "It's a little bit of an odd question. Is that OK?" (This is a good technique for working with the street youth. Always ask permission for your nosy questions.) "Go ahead!" he replied. "Is faith a resource for you?" He began to smile. "Oh, yes! I wouldn't be here without it." He continued, "You probably don't know my story. Three years ago you wouldn't recognize me. I was into drugs and alcohol. I was a mess. But now I don't do any of that and change wouldn't have been possible without Jesus." I said, "Wow! That's awesome. So faith changed your life?" "I was reborn. A new creation. I had to go through a treatment center. I had to get away from here… from the Drag… from this place and all the people I got high with. I had to leave all that old stuff behind." "How it is to be back here now?" I asked. "I walk down here once a week because it's comfortable for me. I spent so much time here. Three years ago I was strung out just like some of these kids. In fact, I see some of the old guys every once in a while. But that's not me any more. I don't need that. I don't even want that." "Do you go to church or some other Christian community?" I wondered. "I go from time to time. To a local baptist church near my house. I like to worship. I 'm shy, so I don't always like to get to know the people there." "Give it time," I said. "Thank you so much for sharing this with me. It's amazing to me that three years ago you were like some of those I minister to daily. Strung out. Looking for your next hit. Doing nothing and going nowhere. I'm so glad that this changed for you. And it gives me hope that it can change for them." He left. While I in no way take credit for his outcome, to see folks like Chuck is the goal of SYM. To offer faith as a resource to see kids come to know Christ, stabilize their lives in a new creation, and connect with Christian community. God is awesome! And the greatest resource around. Why keep it a secret! “Chuck, can I ask you a question?” I was facing a 20 year old male whom I see about once a week. He has a place to stay and goes to school to become an artist. But he comes to see me once a week or so. “Sure he said.” I explained, “It’s a little bit of an odd question. Is that OK?” (This is a good technique for working with the street youth. Always ask permission for your nosy questions.) “Go ahead!” he replied.